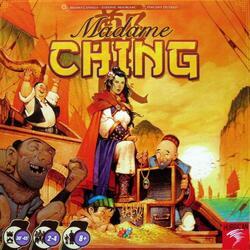 Under Mrs. Ching's orders, use your navigation charts wisely and lead your expeditions to the distant seas of China. During your trip, enjoy unexpected encounters and benefit from the new skills needed to take command of the famous China Pearl. Knowing how to interrupt your expedition at the right time can cover you with gold and precious stones. But why not go further and loot Hong Kong? Contents of the box : 1 game board, 55 navigation cards (numbered from 1 to 55), 33 meeting cards, 20 skill cards, 1 China Pearl card, 1 Hong Kong port card, 23 mission tiles, 8 Jonques (2 red, 2 blue, 2 yellow, 2 beige), 36 gems (12 white, 12 red and 12 blue), 46 gold pieces, 1 game rule.